Another political rally has now been planned for Rohtak, which is fast re-emerging as the political capital of Haryana. After the Congress and the Bhajan Lal faction, today the BJP announced that it would organise a “Haryana bachao” rally in Rohtak on December 23 on the occasion of the birthday of former Prime Minister Atal Bihari Vajpayee. Terming Sunday’s fire incident which killed 10 workers in Panipat, as an “eye opener”, state labour minister A.C. Chaudhary today directed industrialists to get their units registered without any further delay failing which strict action would be taken against them. The shortage of DAP fertiliser has caused widespread resentment among farmers in the area. The farmers desirous of purchasing DAP have to make rounds of the Agriculture Department to get small quantities of it. Pandit Jasraj, an exponent of the Mewati Gharana of the Indian classical music, kept his date with his native village, Pilimandori, in the district on Rajisthan borders. With ambitious plans to increase forest area and conserve wildlife, the week-long celebrations of the wildlife week concluded here today. Haryana minister of state for forest and tourism, Kiran Choudhry, said the state government plans to increase the protected area of forests in consultation with the local people. Camps, nature walks, rock climbing, river rafting, kayaking et al are all happening in Morni, touted as destination next for adventure sports after neighbouring Himachal Pradesh. And, that’s not all with the Tourism Department raring to go on its project for eco-tourism. Haryana finance minister Birender Singh today announced enhancing the rate of dearness allowance (DA) payable to its pensioners from existing 35 per cent to 41 per cent of the pay with effect from July 1 on the pattern of the Central government employees. Randeep Singh Surjewala, Haryana cabinet minister, today said people in large numbers would benefit from the government step of giving free residential plots to Dalits, backward classes and poor people of other castes. The issue concerning the release of land belonging to influential persons from the land acquisition process in Haryana continues to hang around in the Punjab and Haryana High Court. Former CBI director Joginder Singh today emphasised the need to strengthen the Indian Air Force (IAF) to meet the growing challenges of the country. Dr Chander Datt, a scientist working at the ICAR research complex for the NEH region, Tripura, was given the Dr K. Pradhan Young Scientist Award at Tropnutricon-2007, an international conference on animal nutrition held at the NDRI here from Oct 4 to 7. Celebrated internationally to mark the day when universal postal union of the nations was founded in 1874, World Post Day was observed here today with much zest and zeal at a function. Chief post master general, Haryana, Prithvi Raj Kumar, was the chief guest on the occasion. A series of progammes are in the pipleine to be organised in the forthcoming days for the national postal week. Demanding prompt action against the accused in the tree-cutting incident, the activists of Vikas Parishad today met IG, Ambala range, S.S Deswal and handed over a memorandum seeking a high level enquiry into the incident. Two persons were seriously injured when some assailants fired at them at a brick kiln in Bhaproda village of the district today. According to information, the injured, Ishwar and Satpal, partners in the brick kiln and residents of Ismaila village, were sitting at the kiln when four persons arrived in a car and fired at the duo. Three members of a family, including a woman, were today sentenced to life term by the district court in connection with the death of a woman last year. As many as 75 railway passengers were found travelling without tickets in raids conducted by the Railway authorities at Kurukshetra railway station yesterday. According to official sources, 54 passengers were found travelling without tickets. Aanif allegedly murdered his wife, Sano, in Deha basti of Darwa village here. He was allegedly drunk when the incident took place. Sano, a mother of four, had come here to attend to her ailing sister who was to undergo an operation. Nain Sukh (28) in an inebriated condition killed his seven-month-old daughter, Babli, on Sunday night. According to sources, he in a drunken state created a row on the street outside his rented accommodation at Sadhu Shah Nagar, following which he was reprimanded by his neighbours. Two local women today saved a newly born girl who was abandoned by her mother along the road. They spotted the girl near the Begu road and informed the police. The Haryana police has nabbed a four-member gang of looters who indulged in theft in residential areas. The police recovered Rs 10,000 and two-gas cylinders from them. Another political rally has now been planned for Rohtak, which is fast re-emerging as the political capital of Haryana. After the Congress and the Bhajan Lal faction, today the BJP announced that it would organise a “Haryana bachao” rally in Rohtak on December 23 on the occasion of the birthday of former Prime Minister Atal Bihari Vajpayee. Earlier, the Congress organised the massive “bijli rally” in the neighbourhood of Rohtak on October 7. 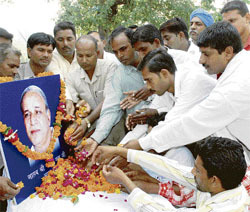 The Bhajan Lal faction of the party has already announced that it would hold a rally in Rohtak on December 2. BJP national secretary Vijay Goel, who is in charge of party affairs in Haryana, said here today that the rally would be addressed, among others, by Vajpayee, L. K. Advani, party president Rajnath Singh and Sushma Swaraj. He said the rally was being organised to protest against the alleged shortage of power and water, rising prices, deterioration in the law and order situation and the ''all-round failure'' of the Bhupinder Singh Hooda government. The BJP has named the Rohtak rally as “bech diya Haryana” (Haryana sold out). Goel said before the December rally, the BJP would also organise “bijli gayab” rallies all over the state to expose the government on the power issue because the Hooda government had tried to mislead the public by holding the “bijli rally” at Jhajjar even as it had generated no elecricity during its three-year rule. Answering a question, Goel said the BJP did not want mid-term Lok Sabha elections but the party was ready to face these if held. He said the BJP would not enter into an alliance with any party in the state. “If anybody wants to join the BJP, he is welcome,'' he added. On the possibility of the mid-term poll in the wake of the conflict between the Congress and the Left, he said nothing could be said as no one could trust the Communists to stick to their word. He also ordered to constitute five high-power teams to ensure safety arrangements in all industrial units. Addressing mediapersons here, he said all 10 families of the deceased would be compensated with an additional amount of Rs 2.50 lakh. The money would be given by the owners of the mill where the incident took place, he added. Five of the deceased hailed from Bihar, four from UP, while one worker belonged to Himachal Pradesh, he added. He informed that power teams had been constituted to look into safety and health arrangements. He said special thrust would be given to ensure cover to all workers under the ESI scheme. Admitting the fact that the labour laws were not implemented in true spirits, he said the defaulters would be dealt with strictly. Lauding the role of trade unions in highlighting the plight of workers, he said their comments and suggestions would be taken to improve the worker-industrialist relations. Meanwhile, the Labour Department today decided to hold a meeting with industrialists in Panipat on Wednesday. Members of various workers’ union under the aegis of the CITU today held a protest march, following the death of 10 workers in the Panipat factory fire on Sunday. They threatened to launch an agitation if timely action was not taken to improve the working conditions of the workers in the industrial township. The workers also held at a meeting at Haali park and later submitted a memorandum to the DC. Trade union leaders demanded a high-level probe into the fire incident. They said the family members of the deceased should be given a relief of Rs 5 lakh and also a lifetime pension b997enefit. The shortage of DAP fertiliser has caused widespread resentment among farmers in the area. The farmers desirous of purchasing DAP have to make rounds of the Agriculture Department to get small quantities of it. Hundreds of farmers from neighbouring villages today visited the office of the SDO, Agriculture, to get their applications recommended for getting DAP. They said they were being issued five bags per application. Meanwhile, the district administration swung into action to ensure that farmers got the fertiliser. Deputy commissioner S.K. Goel in a statement issued said about 8,000 MT DAP was available and there was no shortage. He said its supply to Punjab would be checked so that farmers did not face any shortage. He said farmers were being allotted five bags of DAP and on the recommendations of the deputy director, Agriculture, higher quantities would be given to them. He also addressed a meeting of officials of the departments concerned and instructed them to display the daily stock position of DAP stocks on boards outside the sale points. Meanwhile, former chief parliamentary secretary and state spokesperson of the Indian National Lok Dal, Ram Pal Majra, in a statement expressed concern over the shortage of DAP. He has urged the government to make available sufficient quantity of DAP so that the sowing of wheat was not delayed. The maestro, who was born and brought up in this village, was visiting the village for the second time during the last thirty years today on the invitation of the Yuva Club, an organisation floated by village youth. The recipient of many awards — the Padma Bhushan, Surer Guru, Sangeet Martand, Sangeet Kala Ratna, Sangeet Natak Academy Award, Maharashtra Gaurav Puraskar and the Dinanath Mangeshkar Award, to name a few - lost no time in accepting the invitation of the Yuva Club of the village. Although the purpose of the function was to felicitate Pandit Jasraj, the club had also organised a blood donation camp on the occasion in which 100 units of blood were collected. Pandit Jasraj along with his wife Madhura, daughter of legendary filmmaker V. Shantaram, arrived at Fatehabad last night from Mumbai and drove straight to the village in the morning. He got emotional when he was asked to speak and waved to the villagers. He asked the villagers to provide the best of education to their children. He also requested the authorities to open a hospital in the village as the villagers had to travel long distances for their medical treatment. Earlier, talking to mediapersons, Pandit Jasraj said pop music could not compete with the Indian classical music. Blaming electronic media for providing excessive dose of pop, remix and western music to the viewers, the maestro said it could not in any way lower the popularity of the classical music. Terming the present day music as ‘bubbles of water’, he said pop music would fade away with the passage of time. Madhura mingled freely with the womenfolk after a short address. The village womenfolk in their veils listened to her in awe, as she told them the importance of educating girls. “About 130 acres of pond (Joharh) was being declared as community reserve in the Gaibi Sahib village in Jind district as per the demands of the villagers,” she said. Choudhry added Haryana forest department had taken concrete steps to create awareness among the masses to conserve wildlife and their habitat in the state. On this occasion, the forests minister gave a cash prize of Rs.20,000 each to range forests officer, Gurgaon, Devender Singh Yadav and his driver Sukhbir Singh for their bravery. Choudhry said the Kalesar National Park of Haryana was one of the best parks of the country and to strengthen patrolling, control poaching and for the better management of the park, two elephants were being engaged on experimental basis. The minister further said the government was committed to provide better facilities to the animals in the zoos of the state. She said Bhiwani and Rohtak Zoo were in a process of getting renovated. Various painting competitions and wildlife quiz were conducted for school children in all districts of the state and nature education camps would be conducted in Kalesar National Park for 120 winners of these competitions in four parts, she added. Financial commissioner and secretary, Haryana forests department, H.C. Disodia, principal chief conservator of forests, Haryana, Dr. J.K. Rawat, additional principal chief conservator of forests, Haryana, R.D. Jakati were present on the occasion. “We have got funds to the tune of over Rs 6 crore for promoting eco-tourism in the state. We have zeroed in on Kalaser in Yamunanagar, Hodal, Sultanpur in Gurgaon and Tikkar Tal in Morni for the project. It’s a pioneering effort and we are hoping the public will wake up to the social responsibility of maintaining a clean environment,” state tourism minister Kiran Chaudhary said. She was in Morni to inaugurate the first-ever adventure camp at Tikkar Tal, here, today. With 300 schoolchildren slated to attend the camp over the next one month, the Tourism Department is hopeful of impacting young minds and bring them closer to nature through these camps. “We have some good tourist spots with a lot of potential and we decided to tap this potential by bringing in adventure sports. Taking cue from Himachal Pradesh, we decided to develop our own areas instead of holding camps at their sites. We are enthused by the response of the participants. Such camps go a long way in shaping children’s personalities and inculcating a love for adventure,” she said. After enjoying a boat ride at the lake and interacting with the participants of the camp, she said for the first time the Departments of Tourism, Forest and Sports had come together for organising such an event. “As a part of the conclusion of the Wildlife Week, we will administer pledges to people to protect forests and the wildlife. At the adventure camps our effort is to provide all kinds of adventure sports. However, para gliding has been declared unfeasible though we tried to introduce it in Morni,” the minister stated. Through these camps, the department also aims to provide special opportunity to girls and as many as 160 girls from various districts will be attending the camps. The participants attending the camp displayed river-crossing skills and kayaking besides presenting a cultural show. Earlier, children of local government schools dressed in animal attires stood along the roadside to mark the conclusion of the Wildlife Week. Birender Singh said grant of DA would put additional liability of Rs 36 crore on the state exchequer per year. The decision was announced by Chief Minister Bhupinder Singh Hooda in the presence of Congress chief Sonia Gandhi at a rally at Jhajjar on Sunday. Surjewala said the number of people who would benefit from the step would run into over a crore. He said the announcement was the culmination of a promise made by the party in its election manifesto issued before the last assembly poll. The minister, who was the chief of the Indian Youth Congress and also served a term as working president of the HPCC at a comparatively young age, said Congress governments in the state had given free plots to people in 1974 and 1982 also. Close to three lakh (2.97 lakh) people got free plots on those occasions, he said. Surjewala, who was addressing a press conference, said the latest announcement made by Hooda was further proof that the Congress would continue to give top priority to the uplift of the poor and the downtrodden. He also produced a list of funds allocated for various social welfare schemes by the Hooda regime, to argue that such schemes were now getting unprecedented financial support from the state government. On the belittling of the CM’s announcement by INLD leader Ajay Singh Chautala and rebel Congress MP Kuldeep Bishnoi, Surjewala said the statements given by Chautala and Bishnoi showed them as persons opposed to the development of the state and empowerment of the poor. “Is Bishnoi against the projects launched by Sonia Gandhi in Haryana on Sunday, including the inauguration of a train service and the laying of the foundation stone of a power project?” he asked. The minister said he would go to Germany for two days and meet the visiting Haryana team headed by Chief Minister Hooda at Hamburg. The latter would come to the city on the way back from North America. He said he would arrange a meeting of the Chief Minister with representatives of the Airbus industry. He would also participate in an MoU signing ceremony by the Haryana team with a quasi government organisation of Hamburg on the supply of drinking water, Surjewala said. On the possibility of a mid-term Lok Sabha poll in the country, Surjewala said the Congress was ready for the elections. In 1997, a single judge of the high court “accepted a writ petition” challenging land acquisition in Kurukshetra district. In it, petitioner Dr A.K. Gupta had claimed that he was being discriminated against as lands of persons, or firms, similarly situated had been released from acquisition. These included lands belonging to the then Haryana Assembly speaker H.S. Chatha. Now taking up petitions challenging the acquisition of “the same land” for the development of Sectors 6 and 11 in Kurukshetra, a Division Bench of the high court has expressed dissatisfaction with an affidavit submitted by Haryana. The Bench, comprising Justice Uma Nath Singh and Justice Rajive Bhalla, has ruled that it does not address the query put to the state counsel regarding the basis on which lands of particular influential politician were released, along with chunks that were subject matter of a writ petition. The judges have also fixed October 11 as the next date of hearing and expressed hope that the department concerned will come up with an answer to the query on that day. In one of the petitions against Haryana and another respondent, Pawan Kumar, and 30 others of Thanesar tehsil in Kurukshetra district had sought quashing of the notifications under Sections 4 and 6 of the Land Acquisition Act. Claiming to be landowners, they had added that earlier also the same land had been acquired, but the acquisition was quashed on the grounds of discrimination. Elaborating, they had added that pick and choose policy was again being adopted in the acquisition process and the land of similarly situated persons had been released. They had added that the scheme was a complete flop as major portions of the acquired land had already been released. In an attempt to substantiate their contentions, reference was also made to Dr Gupta’s matter. “The IAF not only protects the country but also helps the civilians during floods and other crisis. It is unfortunate that the Central government did not give enough consideration to strengthen it,” he said while addressing a function organised to celebrate the India Air Force’s 75th anniversary here. The function was organised by the district administration in association with the Indian Air Force at Choudhary Dalbir Singh Indoor Stadium. He also expressed the need for awareness about the defence forces. The glorious years of the Indian Air Force were shown through a film besides an exhibition. Former Air Marshal T.M. Ashthana was the chief guest and DC V. Umashankar attended the function. These include a programme on business development on October 10, in which premium products and services will be publicised. Philately day will be observed on October 11. On October 12, saving bank day will be observed in which customer meet will be organised and financial services of India Post publicised. On October 13, postal life insurance and mails day will be commemorated with organising of workshops. The activists raised slogans demanding justice in the incident. A delegation comprising Som Chopra, Narendra Bangali and Balkesh Vats apprised the IG about the matter and handed the memorandum demanding appropriate action against the persons who had cut the trees. The memorandum demanded that case must be registered against the guilty persons under the Forest Act. “Instead of taking action against the persons who were attempting to cut 1100 trees, police has registered a false case against former MLA Anil Vij, municipal councillors Gagan Dang, Naveen Yadav and former municipal councillor Lalita Prasad who were instrumental during the incident," the memorandum states. Two persons were seriously injured when some assailants fired at them at a brick kiln in Bhaproda village of the district today. According to information, the injured, Ishwar and Satpal, partners in the brick kiln and residents of Ismaila village, were sitting at the kiln when four persons arrived in a car and fired at the duo. The victims were rushed to the PGIMS. The assailants managed to escape after the attack. Police sources said a case had been registered against the four persons on the complaint of the injured. The assailants have been identified as Dharambir, Pravesh, Satte and Mahabir. Two of them are residents of Bhaproda village. Sources said some dispute regarding transaction of money between the two groups could be the reason behind the attack. According to the information, a case of murder was registered against the accused on March 29, 2006, soon after the victim gave her dying statement before a magistrate alleging that she was set ablaze after being doused with kerosene. The case revealed that Reshma, who was married to Satish, a resident of Santnagar, died of burn injuries. In her dying statement, which was recorded at the Civil Hospital in Faridkot, she had alleged that she was burnt to death by her husband, brother-in-law Babu Ram and his wife Mohini. The court sentenced Satish, Babu Ram and Mohini to life imprisonment after they were convicted of the crime. As many as 75 railway passengers were found travelling without tickets in raids conducted by the Railway authorities at Kurukshetra railway station yesterday. According to official sources, 54 passengers were found travelling without tickets. They were released by the special Railway Magistrate, Falit Sharma, after they paid Rs 31,800 as fine, while 21 passengers who did not pay fine were sent to the Central Jail, Ambala. The raiding teams were headed by Swaraj Singh, Jitender Singh and Pramod Saini. Raids were conducted on the 1078 Jehlam Express - running from Jammu Tavi to Pune, the 2497 Shane Punjab - running from Delhi to Amritsar, the 1057 Dadar Express - running from Bombay to Amritsar and the 4731 Inter-City Express - running from Bathinda to Delhi. Police officials thronged the railway station the whole day. Aanif allegedly murdered his wife, Sano, in Deha basti of Darwa village here. He was allegedly drunk when the incident took place. Sano, a mother of four, had come here to attend to her ailing sister who was to undergo an operation. Aanif, a resident of Kalear in UP and a madari by profession, came to his in-laws place on Sunday evening and was reportedly drunk. With the Muslim community observing Ramzan these days, Sano got angry to see him in a drunken state. The two entered into an altercation and Aanif allegedly picked up a knife and stabbed her. Profusely bleeding Sano was taken to a hospital but she succumbed to her injuries. Nain Sukh (28) in an inebriated condition killed his seven-month-old daughter, Babli, on Sunday night. According to sources, he in a drunken state created a row on the street outside his rented accommodation at Sadhu Shah Nagar, following which he was reprimanded by his neighbours. This infuriated him and he started hurling abuses at them. Later, in a fit of rage, he hurled Babli on the street which killed her instantly. Sources said he took the step to put the blame of his daughter’s death on his neighbours. Two local women today saved a newly born girl who was abandoned by her mother along the road. They spotted the girl near the Begu road and informed the police. The mother of the girl has been identified as Shashi and a case under Section 317 of the IPC has been registered against her. Shashi delivered the baby last night and abandoned her in the morning. 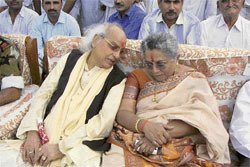 However, keeping in view the condition of Shashi and the baby, both were admitted to the civil hospital. The Haryana police has nabbed a four-member gang of looters who indulged in theft in residential areas. The police recovered Rs 10,000 and two-gas cylinders from them.